How long does a Joe Corbi’s Fundraiser typically run? From the day your brochures arrive, to the delivery of your product, a typical fundraiser takes approximately 4-6 weeks. We will send you your free brochures and throughout your fundraiser we will send updates to help you along the way. You will also receive a sponsor guide with your brochures which will also assist you with your fundraiser. We know how valuable your time is so Joe Corbi’s has everything pre-set for a profitable and successful fundraiser. Where is a Joe Corbi’s Fundraiser available? Joe Corbi’s has fundraising opportunities in the Mid-Atlantic states. Please contact our customer service department at 1-888-526-7247 to get started. What type of groups can run a Joe Corbi’s Fundraiser? Any nonprofit group in the Mid-Atlantic (Maryland, Pennsylvania, New Jersey, Delaware, Virginia, can do a Joe Corbi’s fundraiser. Is there a minimum number of participants you need to run a fundraiser? No, there is no minimum number of participants. You do need 80 units for your product to be delivered or you will need to pick up the product at our Warehouse in Columbia, Maryland. How do I start a fundraiser? Contact us by calling 1-888-526-7247 or fill out our Request Info form. We will take all your information and a sales representative will contact you to get you started. Yes prepack by student is available if your group sells over 400 items. When setting up your fundraiser your representative will walk through the options and the profit levels. What is the minimum order quantity for delivery? For delivery your group must sell at least 80 units. Each item in our brochure is considered 1 unit. If your groups sells 79 units or below then your order can be picked up at our Warehouse in Columbia, Maryland. Is there a shipping or delivery charge? There are no shipping and delivery charges for your group selling a minimum of 200 items. Your group must sell 80 units or more to qualify for delivery. When setting up your fundraiser your representative will walk through the delivery options and any fees (if applicable). What happens if our group does not meet our goal? Can we extend the fundraiser? If your group does not meet the goal you set you can extend your sale. By extending your sale it will change the delivery of your product. We require at least 2 weeks from when the order is place until the delivery date. What do I need to do to make this fundraiser profitable? To make your fundraiser profitable we suggest you follow the 4 P’s. Planning – What is your group fundraising for? What is your goal? Prizes – How will you get everyone participating in this fundraiser? Presentation – How will you let everyone know about your fundraiser you are running? Promotion – During your fundraiser what are you doing to keep the excitement going? How does profit work for this fundraiser? Your group will earn a minimum of $5.00 on every item sold over 100 units. Profit is based on the number of units sold. A group must sell at least 80 units for delivery to your group. Groups that sell 79 units or under will need to pick up the product at our distribution center in Maryland. Want to sell more units?? Work with your representative on creating an incentive for your group. There are many low cost/no cost options that have been successful to raise the number of units sold for your group. Are there any costs for my group when we signup? No, there are no costs to your group when you signup. At your delivery you will pay for your product and will keep the profit. I was expecting the prices of the products to be less expensive? At Joe Corbi’s Fundraising we only use quality ingredients and give you no added fees or costs with your fundraiser. 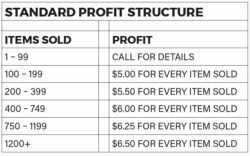 Each group that sells over 100 units will earn at least $5.00 per item in profit. Your brochure online does not have pricing. How do I get a list of prices? Please contact our customer service department at 1-888-526-7247 and they can get you a list of prices. Who does my group make the checks out to? Your participants will make all the checks payable to your group. At the delivery you will give the driver one payment for the amount without the profit payable to ADKO Associates, Inc. After your order is placed you will receive an invoice with the total amount due at delivery. How do I pay Joe Corbi’s for my fundraiser? You pay on the day of delivery. You will give the driver your payment when they arrive. Payment is made to ADKO Associates, Inc. When will I get my invoice from Joe Corbi’s? You will receive your invoice usually within 5 business days of your order being placed. Can I pick my delivery date when I setup my fundraiser? If you do not have a predetermined delivery date and time for your fundraiser is will be scheduled after your order is placed. Your group must sell at least 80 units for delivery. Delivery of your product is based on the when your order is submitted either by phone or mail. Can I order product if I am not associated with a fundraiser? Unfortunately you cannot order our products directly. In order to provide exceptional customer service to our fundraising customers, we no longer offer kits directly. We apologize for this inconvenience. Please call us at 1-888-JCORBIS (526-7247) and one of our customer service reps will be happy to assist you with finding a fundraiser in your area. How are my products delivered? Your products are delivered on a refrigerated truck. The driver will assist your group with getting your products to the pickup location. How long does it take to get delivery from when I place my order? It takes typically 10-14 business days from when your order is placed until delivery. For when delivery is available in your area please call our Customer Service representatives at 1-888-526-7247 for details. Once our product is delivered how long can it stay out of refrigeration? Your fundraising items can be kept out of refrigeration for up to 4 hours after delivery. Your pickup location should be a cool place away from direct sunlight and heat. Please return items to the freezer as soon as they are picked up to ensure product quality. Are your products stored in a freezer or refrigerator? All of our fundraising items are kept in a freezer at a chilly -10 degrees. Do you have any Kosher products? All of the sweets in the brochure are Kosher as well as our Traditional Soft Pretzels. Do you have any Gluten free products? Yes, Joe Corbi’s has a Gluten Free Pizza Kit. Item number 105. Do you have any Dairy free products? Please check out our nutritional guide for item ingredient details. Do you have any nut free products? We do have some nut free products but all of our products are made in facilities where nut ingredients are processed. Do you have any vegetarian products? Yes, we have items that are meat free but many of our products contain ingredients where animal products are used. Do you need to cook these pizza’s on a pizza stone? No, pizza’s can be cooked directly on the oven rack. If you cook the pizza directly on the oven rack you will find the crust is more crispy. If you enjoy a more chewy crust you may want to cook in a pan. Where is the nutritional information and baking instructions for your products? On the outer packaging of each product. If you threw away your boxes you can get the full list of ingredients and baking instructions on our website. Can you eat unbaked cookie dough? No, you must bake our cookie dough before serving. How long do your products last in the freezer? Most of our products are good for between 6 months to 1 year in the freezer. You can check the packaging of each item for specifics. Copyright © 2018, Joe Corbi's..